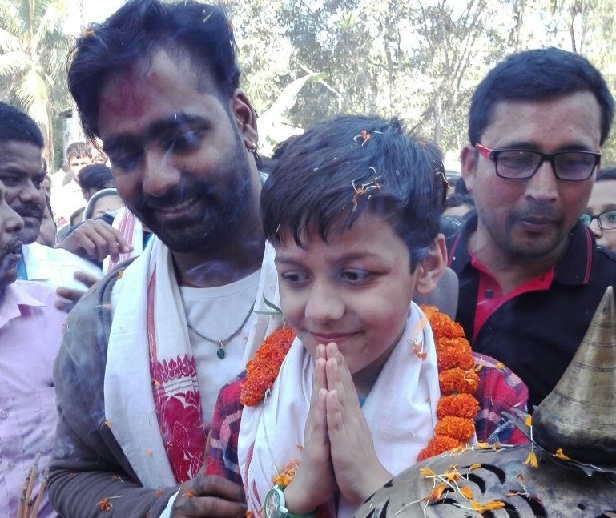 Jorhat was agog with excitement on Thursday with people lining the roads from Rowriah airport to Dulia Gaon to catch a glimpse of Bishal Sharma. Bishal, a finalist in the Super Dancer reality show of Sony TV , returned home for a day to a hero’s welcome. The boy, a student of Class VII of Garmur Jatiya Vidyalaya, has mesmerised audiences since August, 2017 and is a strong contender to win the Rs 25 lakh prize money. His coach, Baibhab Jodi, who had accompanied the boy, said that the competition would be between Bishal and another boy from Assam, Akash Thapa. The other contenders were Shagun Singh, Akash Mitra and Muskan Sharma. 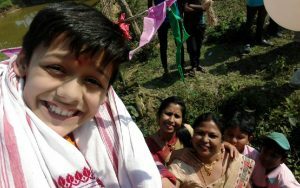 Sony TV shot different facets of Bishal’s life at home and at school. He was first taken to his home at Dulia Gaon in Garmur where he was clicked eating kheer, his favourite food and then brought to school where he danced the Bihu with the school troupe. Later, Baibhab and Bishal showed some of the dance moves and stunts on a makeshift ramp and stage set up by the school. “It was amazing to see the heart stopping gyrations and twirls which are shown on TV, ” Swantana Sharma, Principal of the Vidyalaya, said. Bishal under the tutelage of Summit Sankar here had made it to the Super Dancer series of Sony TV but was eliminated early. Sharma said that a lot rested on young Bishal’s shoulder. Super Dancer’s finalist Bishal in Jorhat. Bishal’s parents, who have three children, subsisted on the produce of two cows. They live in a shack and he is in debt to the tune of more than Rs 7 lakh by way of loans. “Bishal’s father, an alcoholic often beat his children and wife and is a work shirker. He has been with Bishal in Mumbai, as a guardian for the past seven months leaving his wife and two daughters, one has appeared in HSLC Examination this year, to fend for themselves. Bishal is their only hope,” she said. Swantana Sharma said that she had managed to find employment for Bishal’s mother as a nanny. All the teachers were pitching in with essentials like rice, lentils, vegetables and cooking oils so that the family here could survive. One has to download the Sony TV app to vote for Bishal. The finals are scheduled forMarch 18.